Bishop Petros I With Saint Peter the Apostle. Late 10th century,tempera on plaster. National Museum, Warsaw. The Christian history of Nubia is one of the lesser-known aspects of this fabled land. A rare glimpse into its medieval period (circa 400-1500) is provided by the chance survival of one of the main churches of Nubia: the cathedral of St. Petros at Pachoras (modern Faras), once adorned by the fresco seen here. The city was located by the second cataract of the Nile River, near the present-day border between Egypt and Sudan. Rebuilt twice, the church stood in its final state for more than 200 years, until the dome and central nave collapsed about 1170. For the next 800 years, the site lay abandoned and covered by the desert sands. Then the impending construction of the Aswan High Dam in the 1960s led to the urgent excavation of the church and the recovery of its treasures. Foremost among these was an intact series of wall frescoes depicting devotional scenes and portraits of lay and ecclesiastical authorities. Excavated by a Polish archaeological team, these priceless relics are now distributed between the National Museums of Sudan and Poland. A wealth of associated inscriptions identifies the richly robed figure seen here as Petros I, the Metropolitan (city) bishop of Pachoras, who reigned during the last decades of the 10th century. He died on July 20, 999, at the age of 93, according to his funerary epitaph found nearby, and was responsible for a major phase of the pictorial decoration of the cathedral, distinguished by its penchant for yellow, red and green colors. 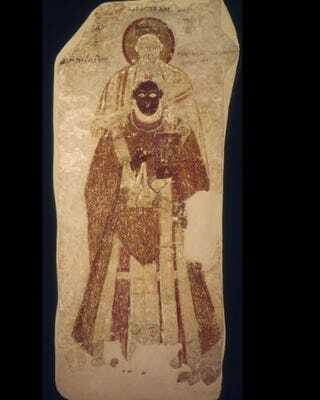 He is shown life-sized, holding a sacred text and wearing the salma, or ceremonial mantle of the Nubian church. Behind him stands his patron saint, the apostle Peter. Frescoes such as this seem to have been commissioned upon the ascendancy of each bishop to the throne, so the image of Petros I here can be regarded as an actual likeness. Though sacred figures in the cathedral frescoes are light-skinned, the bishops, like Petros, all seem to have been dark-skinned Nubians. The church of St. Petros presents a time capsule of medieval Nubian history at the peak of its importance. As was characteristic of Nubia throughout its long recorded history of at least four millennia, the social, religious and political structure of Petros’ time was quite cosmopolitan. Trade with Egypt and other lands was brisk and sustained, and artistic influences were felt from as far abroad as Syria. In images such as these we can perceive the great vitality of a lost culture that deserves to be better-known.